Let me paint a typical holiday picture. You've begun an exercise program, and you know that frequently eating out could slow your weight loss and fitness progress, if you're not careful. So what do you do? The vegetables sound healthy. So you order the veggie pasta with a side salad and a diet soda. Then you sit back to enjoy a few slices of bread. That sound like you? I hope not, because if it is you it's not surprisingly that you're unable to lose weight even though you exercise regularly. There's an adage that states that 80% of your weight loss results are derived from diet, and the remaining 20% from exercise, so you can see how important it is for you to stick with a healthy eating plan. Appetizers are a great way to start out a leisurely meal, but can also derail your good intentions to stay fit in a hurry. Anything fried. Fried foods are a favorite, but will do damage that even the most intense workout won't undo. Bread. It comes smothered in cheese or seeped in butter, and even when it's plain it fills you up with more carbohydrates than your body needs. Calories in drinks are sneaky because they don't fill you up. This means that you end up taking in far more calories than you bargained for. Regular or diet soda. On one hand you're drinking corn syrup through a straw, on the other you're drinking chemicals that cause you to crave sweets. It's a no win situation. Sweetened tea. You may feel righteous for ordering iced tea, but if it's sweetened then you may as well be drinking fully loaded soda. Water. Don't laugh! Water is the best beverage of all. Unsweetened iced tea. Don't ruin it by adding that packet of sugar. Learn to enjoy the natural sweetness to the tea. This is where the real damage is done. When you order something carb-loaded you leave the restaurant feeling heavy and lethargic; you may not even realize this until you start eating better and experience the light, energetic way you'll feel after eating a healthy meal. Pasta. I don't care if it comes with red sauce or white sauce, meat or veggies. If you're trying to lose weight and maintain a lean body then never, ever order a plate of pasta. Pizza. Another dish that has far more carbohydrates than you need. If you're craving the pizza toppings then simply order those over a salad. If you still have question call or email today, I'm here to help. Use me as a resource. So you've decided to ditch your old eating habits and embrace a new diet of lean proteins and lots of veggies. You know that your new eating strategy will lead to many pounds lost, but you can't get your old favorite foods out of your mind. When you spend time dwelling on the burgers and pizzas that you loved, you're setting yourself up for a relapse. The best way to stick with your new healthy eating habits is to focus on all the new foods that you now enjoy. Get a new cookbook or visit websites that present new and tasty ways to prepare healthy food. Find new favorite foods to love, foods that are healthy and guilt free. There are lots of great tasting, healthy foods out there. Take the time and have the fun to finding them. You'll be pleasantly surprised with the results. Do you like pancakes? I do, and I found this great healthy recipe. 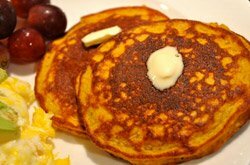 Give it a try, and enjoy these tasty pumpkin pancakes without guilt. Made with almond meal and packed with protein from eggs, these pancakes are sure to satisfy without shortchanging your results. In a medium bowl, mix all of the ingredients together. Heat pancake griddle to medium heat and coat with cooking spray. Cook each side about 3 minutes until brown, then flip and cook remaining side. Nutritional: One serving equals: 255 calories, 15g fat, 112mg sodium, 11g carbohydrate, 5g fiber, and 19g protein.